"Benson & Miller Bangor Carnival Parade Float, June 18, 1912"
"As general opinion as heard on the street, it was a toss up for favoritism between the float of Freese, with its bevy of butterfly maidens and the float of Benson & Miller, which delightfully set off its white background with yellow flowers and trimmings, while within the square of enclosed 'yard' was a number of beautifully dressed young women of were observed of all observers. Over all was a canopy of white, and an arch with the name of Benson & Miller in yellow chrysanthemums. The four horses wore big shamrocks as decorations of their fly shields." Benson & Miller at 15-17 Main Street was operated by Harry D. Benson and William C. Miller. The store sold ladies' suits, coats, underwear, hosiery, gloves and silks, dress goods and linings. 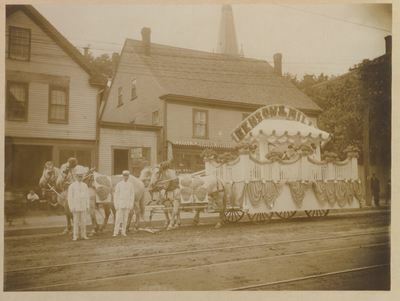 Location of photograph is 273-275 Main Street, as the businesses of shoemaker Daniel C. Devoux and Samuel Schiro, a fruit and confectionary store, are visible in the background. Source: 1912 Bangor city directory.